A 48-hour strike by some Tube maintenance workers began at 1900 BST, after the High Court refused to grant an injunction to stop it. Tube Lines, responsible for repairs to the network, lodged the legal challenge against the Rail, Maritime and Transport (RMT) union. It questioned the accuracy of the vote for the strike, expected to hit the Northern, Piccadilly and Jubilee lines. The row is over proposed changes to jobs, pay and conditions. However, Transport for London (TfL) has insisted it does not expect any significant disruption to passengers between now and the end of the walkout, at 1900 BST on Friday. Tube Lines claimed the strike ballot was inaccurate as it only employed 30 engineers, whereas the union said 47 staff members had voted. A Tube Lines spokeswoman said: "You can't have more people voting than are employed." At the court, Mr Justice Tugendhat said he had reached a "clear view" that he should not grant an injunction but did not disclose why. RMT general secretary Bob Crow had earlier called the ballot "perfectly bona fide". He described the ruling as "a massive victory, not only for the RMT and our members, but for every group of workers who stand and fight against job cuts and attacks on working conditions". "The strike goes ahead and will be solidly supported," Mr Crow added. "We expect major disruption across the network." 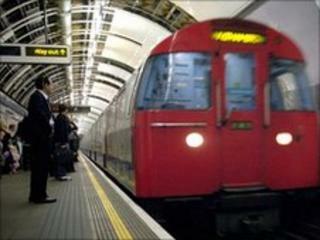 Tube Lines announced its decision to take legal action after the RMT turned down a new three-year pay deal on Tuesday. The firm offered a 3.7% pay rise in the first year, backdated to April 2010, and another 0.5% subject to agreeing productivity changes. The agreement over the next two years would have been in keeping with the retail price index (RPI) plus 0.5%, with 0.5% guaranteed if RPI falls below 0%. Andrew Cleaves, acting chief executive of Tube Lines, said he was "deeply confused" at the rejection "when Aslef, TSSA and Unite have given strong indications that they are prepared to accept the same pay deal". But a spokesman for the RMT said the deal was "unacceptable". Geoff Martin said: "The pay deal was loaded with a whole pack of strings in relation to productivity. "This was unacceptable. Also Tube Lines gave no assurance on jobs, which is central to our dispute." TfL is due to bring all the work currently undertaken by Tube Lines in-house. The union fears that "potentially hundreds" of jobs could be at risk after the takeover as TfL looks for efficiency cuts. A further court hearing will be held on 9 July to decide if an injunction should be granted ahead of the next planned strike on 14 July.